Product #21992 | SKU AH-QU-16 | 0.0 (no ratings yet) Thanks for your rating! 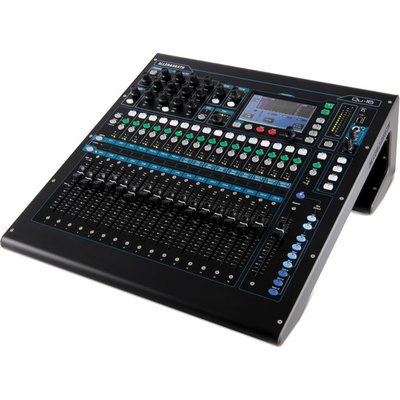 The Allen & Heath Qu-16 Rackmountable Digital Mixer is a 16-channel digital mixer and USB audio interface designed for live and installed sound as well as studio use. It features 16 mic or line selectable inputs and 3 stereo line inputs. Its 16 anaLOGIQ microphone preamps have digitally recallable settings that can be saved and recalled for future sessions. The Qu-16 has a variety of output options, including 4 mono XLR mix outputs, 3 XLR stereo-pair mix outputs, an alternative TRS stereo-pair mix output, a TRS stereo-pair 2 track output, and a 2 channel AES digital output. The Qu-16 has 16 busses as well as 4 stereo effects returns, and offers a variety of routing options and controls. It has a 5" 800x480 resolution touchscreen that displays your metering and RTA views, effects tracks, processing, routing, and saved scenes. The 16 tracks are controllable with the 16 100mm motorised faders. Built-in processing allows you to AEQ, compress, gate, switch polarity, and apply delay to all 16 tracks. All of your settings can be saved as a scene and recalled later for quick set up. Thanks to its internal convertors, the Qu-16 is also a USB audio interface and can record to any Core Audio compatible software on your Mac. You can also record to and play back audio from an external USB hard drive. It is compatible with the Qu-Pad iPad app that allows you to control your mix with your iPad over a connected wireless network. The Qu-16 unit itself can be rackmounted or set up on a desk.